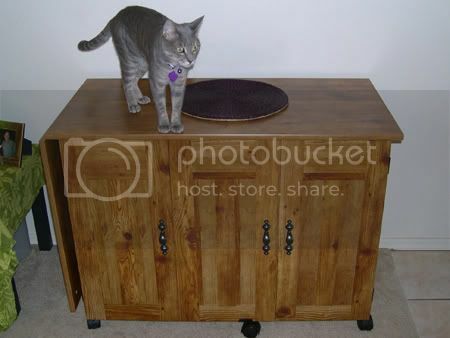 We saw it advertised in Walmart's Black Friday circular where it was priced at $75. 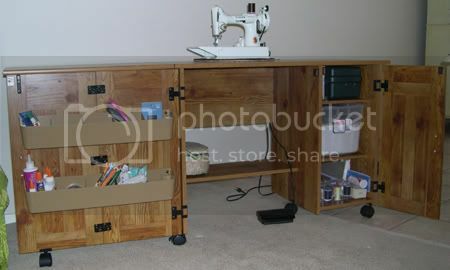 It was listed as "Sewing Craft Table." I really wanted it but I couldn't get excited about having to fight people on Friday morning to get it. However, I went to Walmart this morning and they already had it at that price! 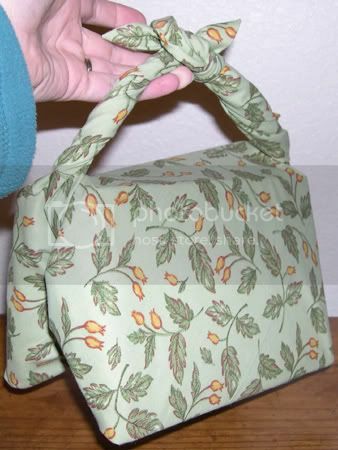 If you're interested, I found it in the fabric department on a shelf below the sewing machines. 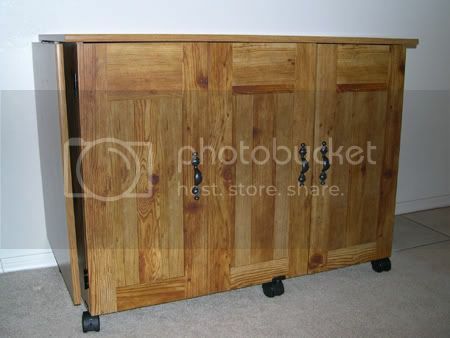 It's manufactured by Sauder and the product number on the box is 9707-150. Walmart also has it listed online where it's currently selling for $97.42. It took me about 2 hours to assemble by myself. Compared to other self-assembly furniture instructions I've tried to follow, these directions were detailed and well written. Also, all of the pieces of wood had identifying numbers stamped or stickered onto them so I didn't have to guess which piece was which. 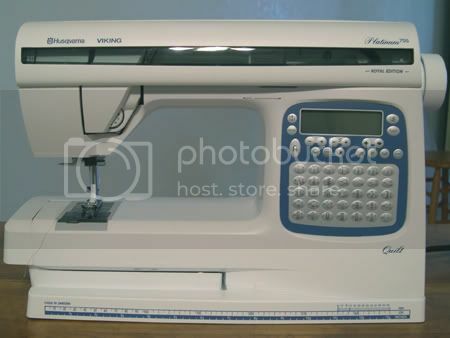 That's the only thing I find awkward about it - it's difficult to put my machine down there, and it's a featherweight. Someone with a heavier machine might have trouble getting it down there without dropping it. 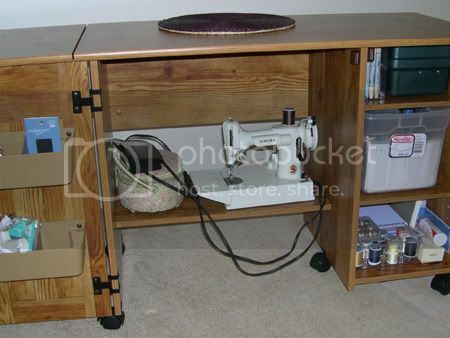 I'm so glad I found this - I no longer have to do all my sewing on our living room floor! Now I can wheel the cart out when I need it and push it back against the wall when I'm done. 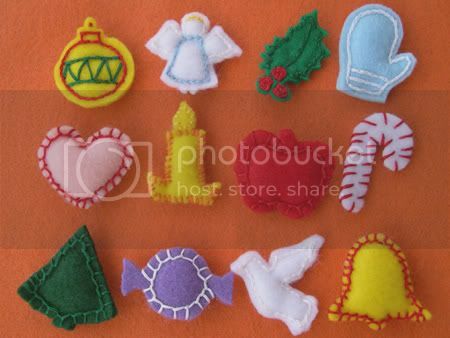 Note: This is the second of three posts about how I made my felt Advent calendar. For information on how I came up with the idea see Part 1; for instructions on how to make the calendar itself see Part 3. I finally finished all 24 ornaments for the Advent calendar! 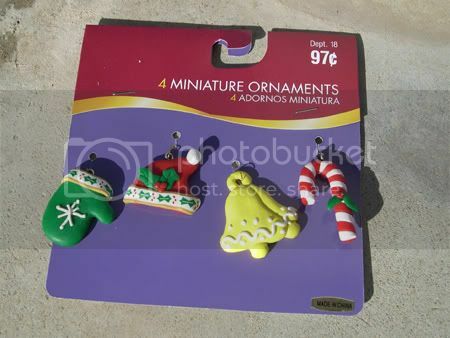 Actually, since I'm making 3 identical calendars it was a total of 72 ornaments! 1. 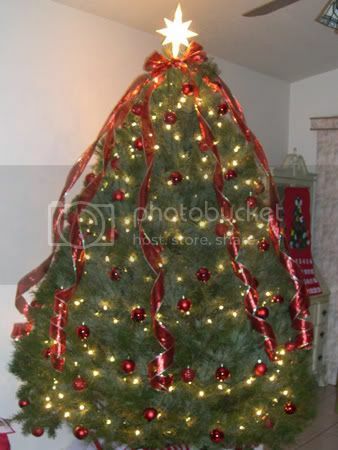 I first came up with a pattern for each ornament. They had to be smaller than 2 inches square so they would fit into the pockets on the calendar. For the easier shapes, such as the heart or the letters, I drew the pattern myself. 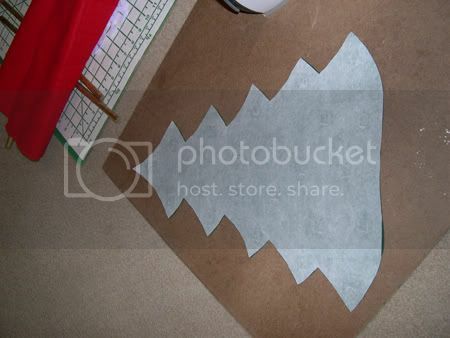 For the harder shapes, I used Google image search to find a picture of a stencil or cookie cutter in the shape I needed. 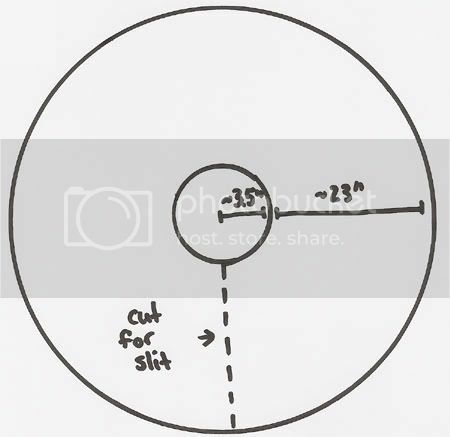 I downloaded the image and re-sized it so that it was smaller than 2 inches square. 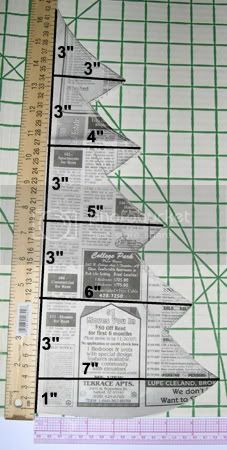 I then printed and cut out it out to use as a pattern. 2. I pinned the pattern to two stacked sheets of felt. 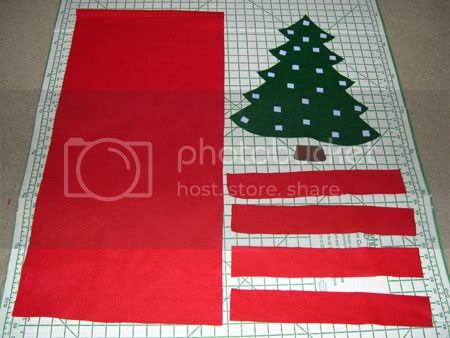 I then cut out the pattern on both sheets at the same time, creating one front and one back of the ornament. 3. 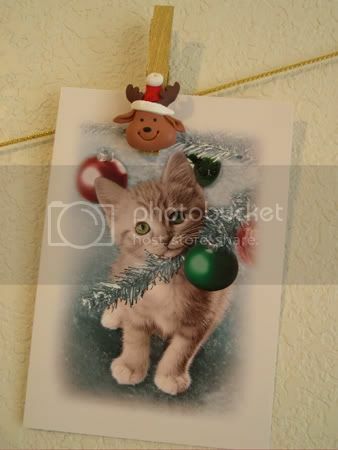 Using my sewing machine, I attached a square of Velcro (the fuzzy side) to the back side of the ornament. 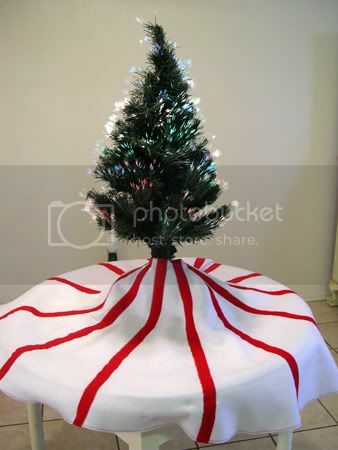 I saved the "prickly" side of the Velcro in a ziploc since I would need it later for the tree. 4. Next I used embroidery floss to sew the front and back of the ornament together (right sides out). Before I completely sewed it shut, I stuffed a small amount of batting into it. 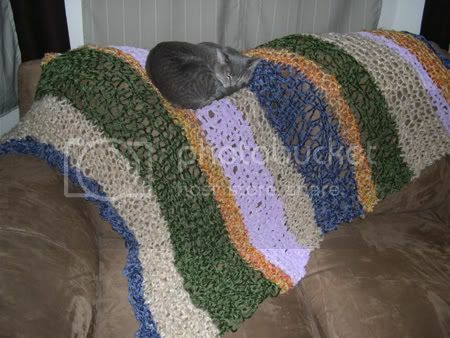 As you can see from the photos I used several different stitches. Since I don't know much about stitches, I just experimented until I found ones that looked good. 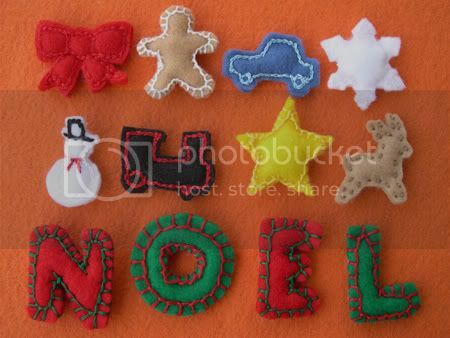 The blanket stitch (see "NOEL" letters) worked fine for simple shapes. On more complex shapes I used a running stitch (see the reindeer) or a split stitch (best seen on the car or the mitten). Next I'll be working on the calendar itself. I'm guessing the hardest part will be making the felt numbers for the 24 days. By my calculations that will be 117 individual numerals to cut out! Update 11/18/07: I finished the entire calendar! 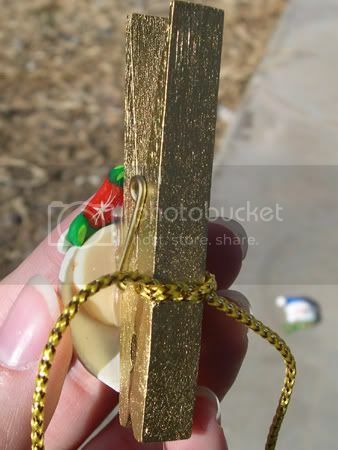 For photos and instructions, please see Advent Calendar Part 3 - Complete Instructions. My husband and I have been searching for an alternative to pre-packaged Hamburger Helper Cheeseburger Macaroni. In the past we tried making it from a Campbell's soup recipe and it was not a success. I came up with the recipe you see below and we tested it last night. While it wasn't an exact match for the original, it tasted pretty good. Since we used turkey, I added beef bullion to give it a beefy taste. I can't be sure exactly how many cups per serving we ended up with, but it made enough for two large platefuls. Prepare salted water for macaroni. While wating for water to come to a rapid boil, brown the ground turkey according to package directions. Drain turkey (if necessary). Dissolve bullion cube in 1/2 cup of boiling water. When salted water is at a rolling boil, put macaroni in and return to boil. Boil macaroni for about 7 minutes or to taste. While macaroni is boiling, add cheese soup, beef broth, and milk to the turkey. Simmer for about 7 minutes (while waiting for macaroni to be done). When macaroni is ready, drain it and add it to turkey mixture. Stir and serve. Note: Most hamburger helper style recipes have you add the uncooked macaroni to the meat and sauce mixture and simmer it. I've had problems getting the pasta fully cooked this way, so I just made the macaroni separately. 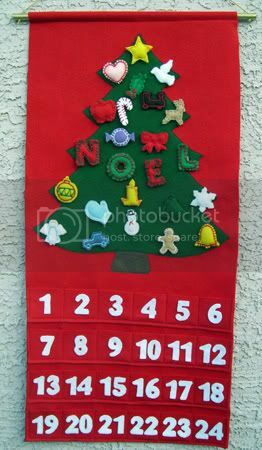 Note: This is the first of three posts about how I made my felt Advent calendar. For information on how I made the ornaments see Part 2; for instructions on how to make the calendar itself see Part 3. 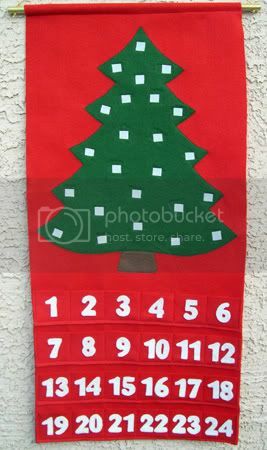 The project I'm currently working on is an Advent calendar (a calendar that counts down the days until Christmas). 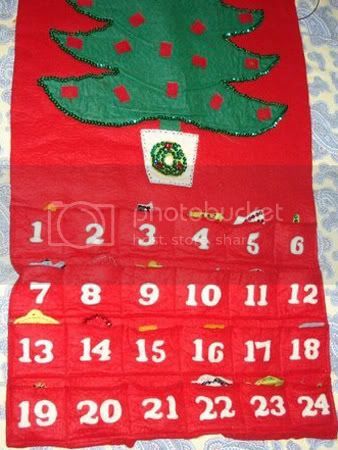 I'm using my family's Advent calendar as a guide - it was made for us by my paternal grandmother many years ago. Hopefully they're all recognizable! 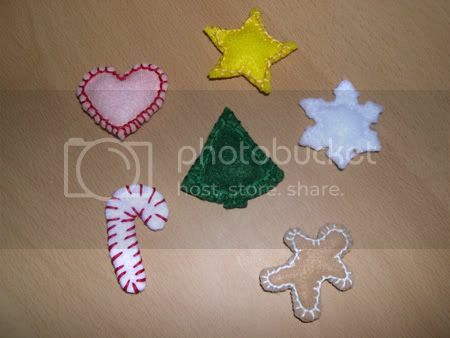 If not, here they are clockwise from the bottom right: gingerbread man, candy cane, heart, star, snowflake and Christmas tree (in the center). 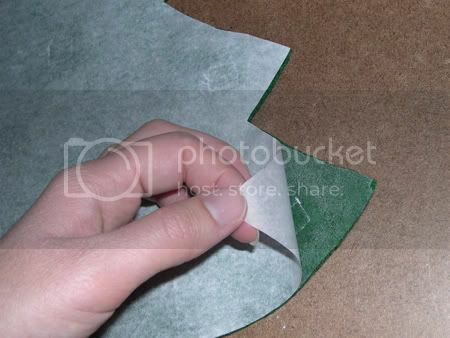 They are made of two pieces of felt, stuffed with batting and with Velcro on the back. I used embroidery floss to sew the pieces together. 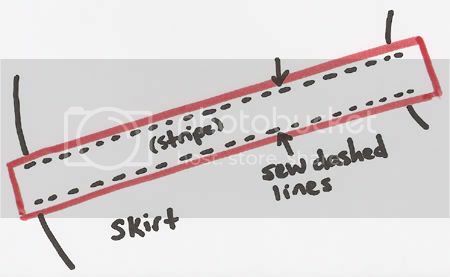 The sewing is pretty easy. 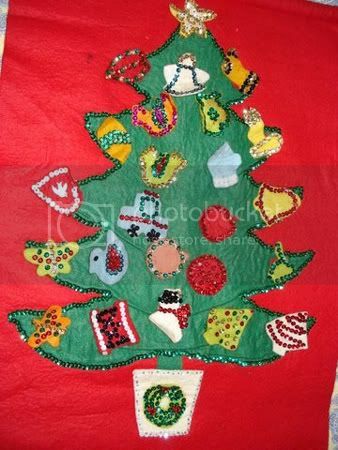 The hard part is coming up with 24 different recognizable ornaments. Since I'm no good at embroidering details on them (I've tried, but it looks awful! 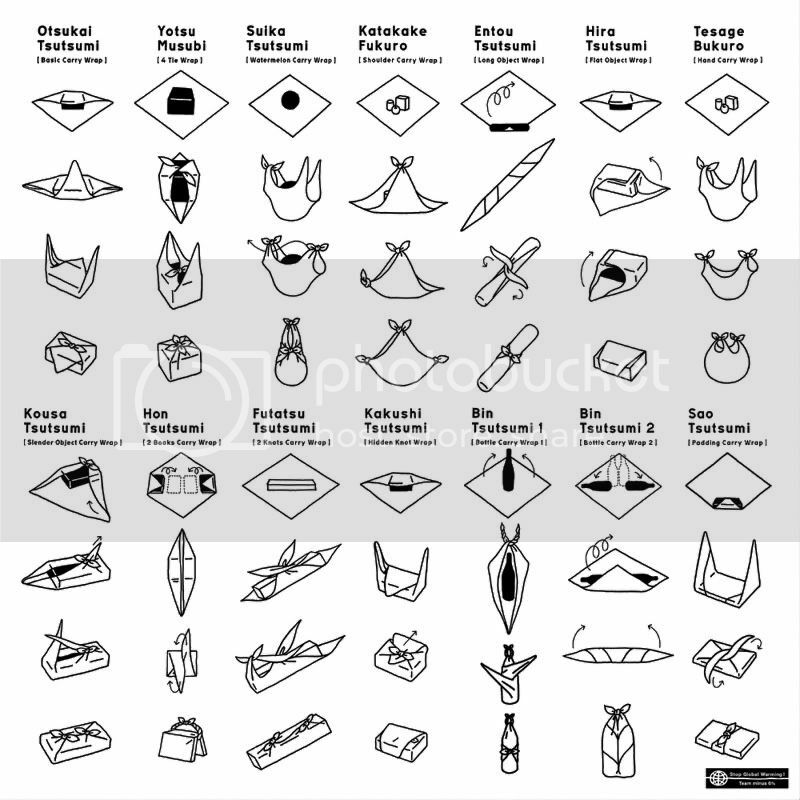 ), they have to be identifiable by their shape alone. I'm using the ornaments on the original Advent calendar as inspiration, but some of them would lose their meaning without the details sew on. So far the other ornaments I have planned are: bell, candle, apple, piece of candy, car, train, ornament (you know, the old fashioned glass ones that are shaped like a turnip), and the letters in NOEL. That brings me to 17, so if anyone has suggestions for other ornaments, I'd love to hear them! Update 11/15/07: I've finished all the ornaments! 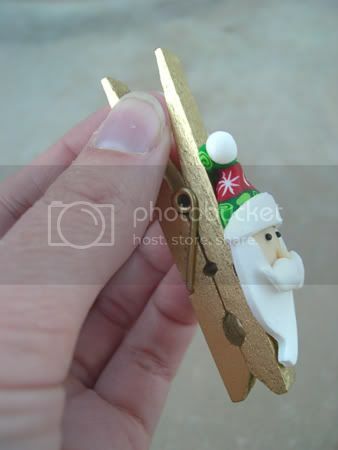 For photos and instructions, please see Advent Calendar Part 2 - Ornament Instructions. Update 11/18/07: I've completed the entire calendar! 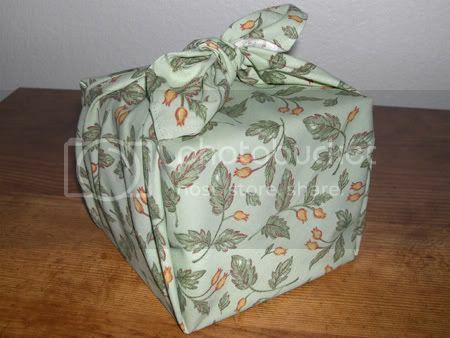 For photos and instructions, please see Advent Calendar Part 3 - Complete Instructions. 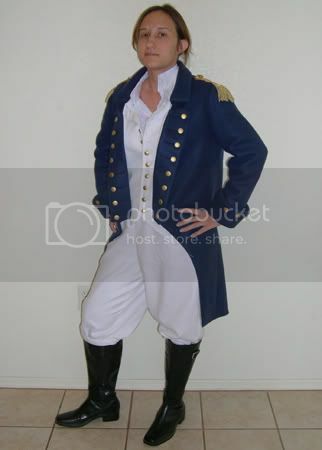 Here's the details on the Jack Aubrey costume that I wore to our Halloween party. 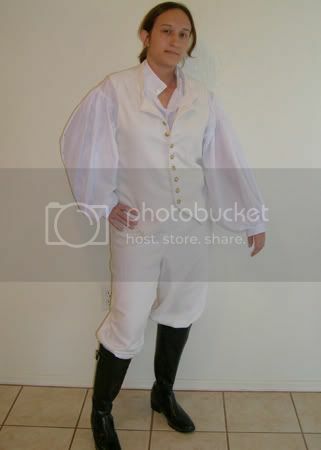 I made this costume based on the everyday uniform worn by Russell Crowe in the movie Master and Commander: The Far Side of the World. I made everything but the boots from scratch. 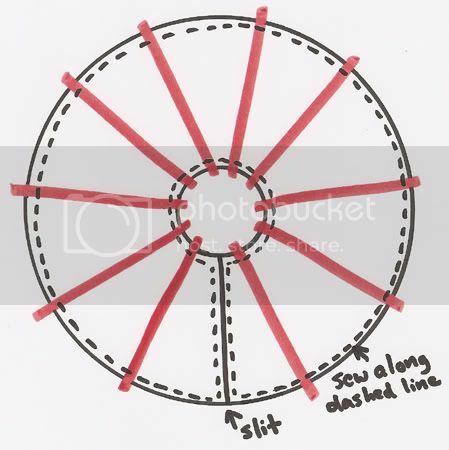 Below, I'll cover each part of the costume individually. Update 5/22/08: If you're interested in more costumes from the Master and Commander movie then please check out my photos and drawings of several outfits on display at the Maritime Museum of San Diego. 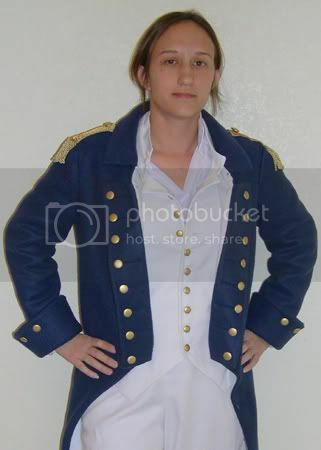 Update 9/18/12: Check out some photos of a no-sew Jack Aubrey costume here. 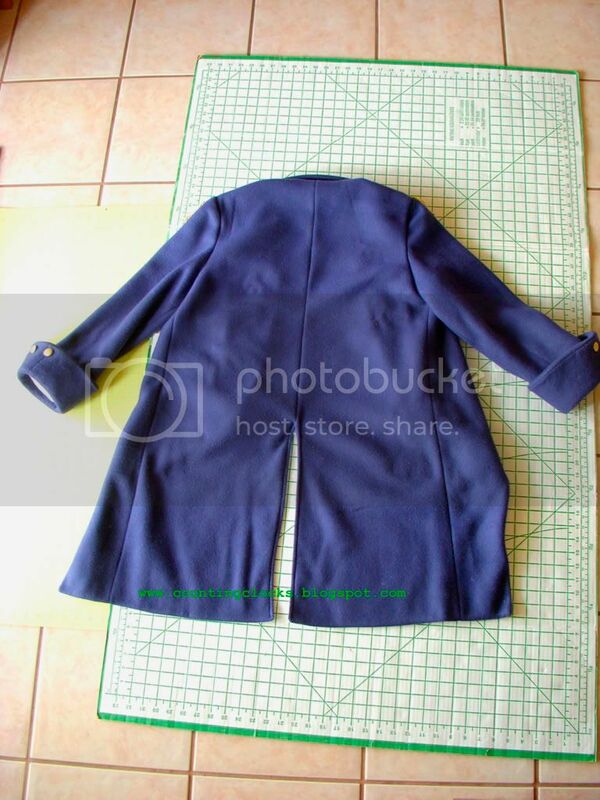 What I Did: So that it would resemble Jack's jacket, I modified the McCall's pattern by adding the fold-over lapels (where the buttons are) and removing part of the jacket below the lapels. 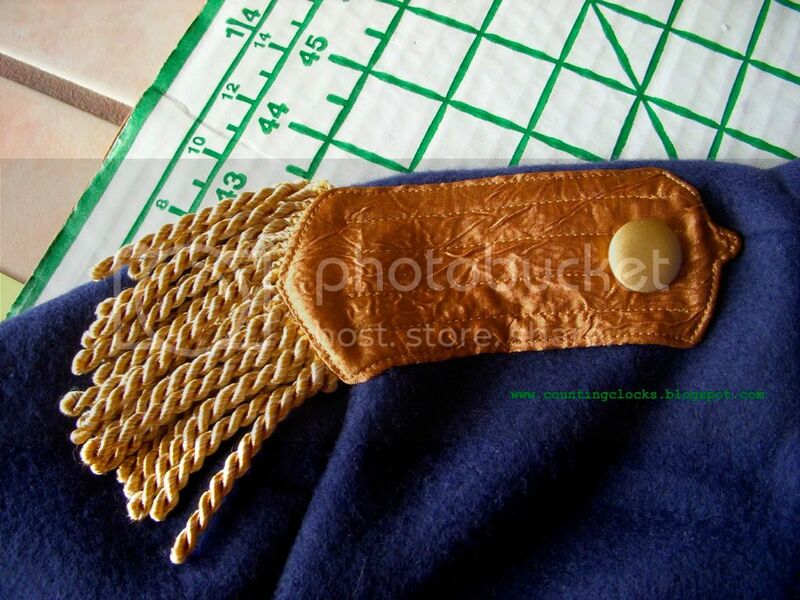 I made the epaulettes (shoulder decoration) separately and sewed them on at the end. 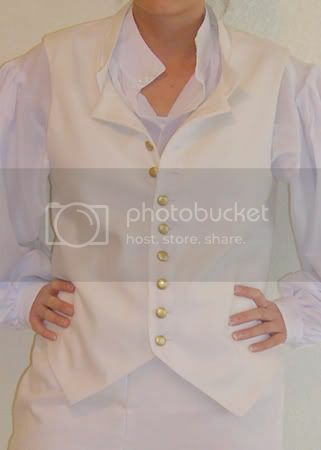 The buttons were cheap white ones that I spray painted gold (the same with all the other buttons in the costume). What I Liked About the Project: Of all the costume pieces, the jacket took the longest to make but I think it turned out great. It was surprisingly comfortable. What I Didn't Like About the Project: The weight of the lapels often caused them to roll back and show the lining of the jacket. 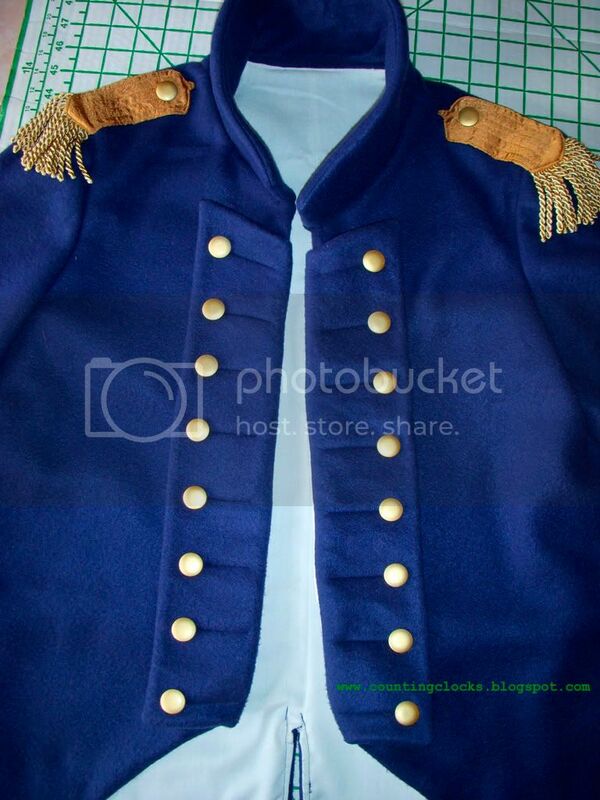 The epaulettes could have been a little bigger. 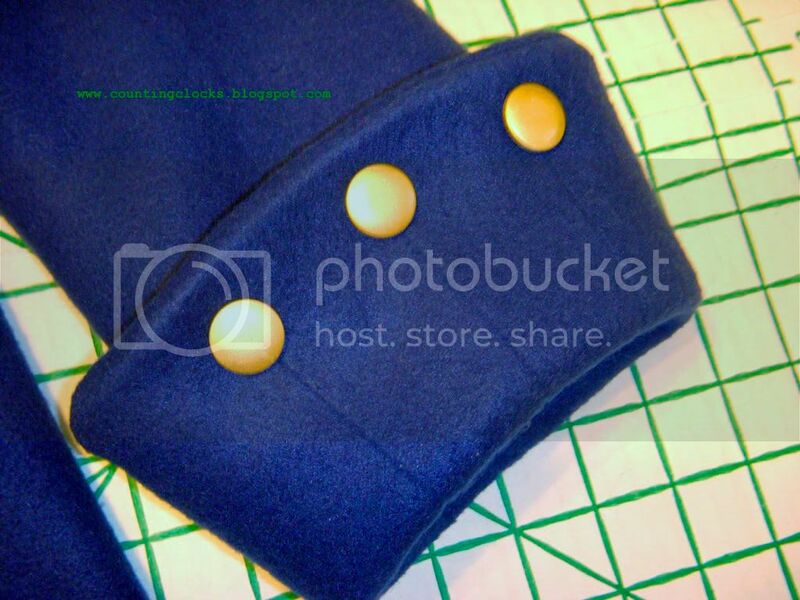 I wanted to use real brass anchor buttons but it would've cost me around $40 to get them. The spray painted buttons look fine, but those on the sleeves are already starting to get scratched. What I Did: I started with the pirate vest (McCall's 4626) and modified the pattern by giving it a high neckline. I did that by adding the neckline from the McCall's 4864 colonial jacket pattern to the pirate vest pattern. I also made the vest significantly shorter. 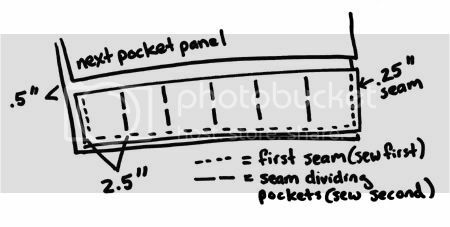 Since I don't have a buttonhole maker, I originally considered using sew-in snaps hidden under the buttons. 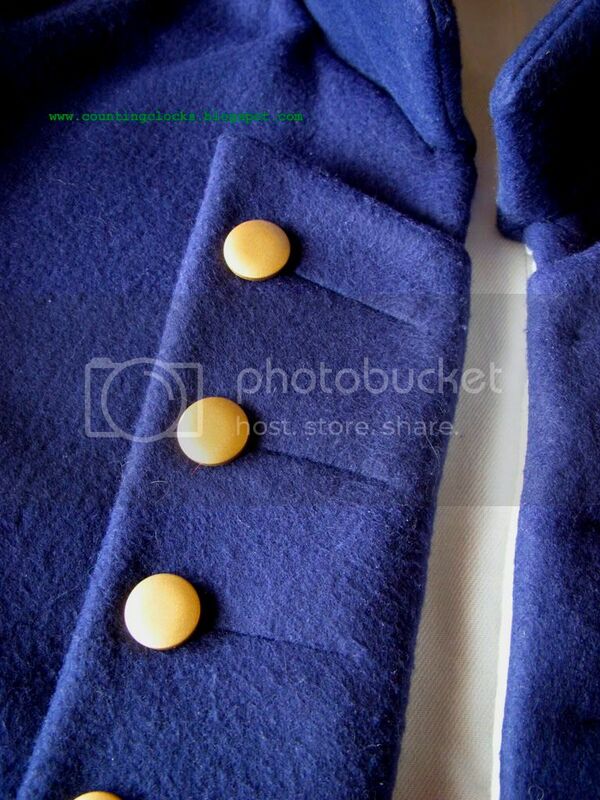 But the snaps could not be hidden well, so I broke down and made real buttonholes by hand. What I Liked About the Project: Considering that I had never sewn a buttonhole of any kind before, I think they looked very good. 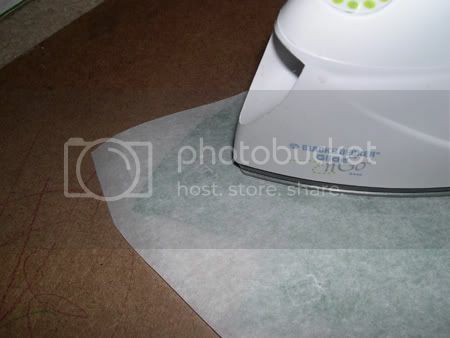 What I Didn't Like About the Project: I wish that I had used sew-in interfacing instead of fusible interfacing. 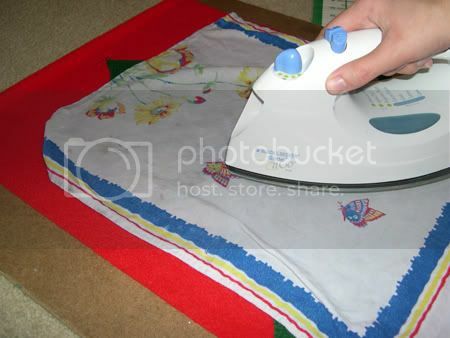 The fusible interfacing under the buttons caused the fabric to ripple. Since the vest was lined in the same fabric as the outside, I was able to turn it so that the ripples were on the inside. What I Did: I sewed the pants according to the pattern. The only change I made was in the number of buttons on the legs of the pants. What I Liked About the Project: It was fast! 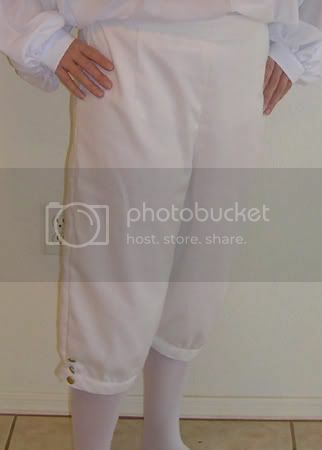 The pants were the easiest part of the costume to make. What I Didn't Like About the Project: I should've made the small size instead of the medium, because I had to pin the pants to keep them sitting at my natural waist. Since the pants were white-colored and unlined, they were practically see-through so I had to wear white tights underneath them. Even then you could still see the tucked-in shirt tail clearly through the pants. 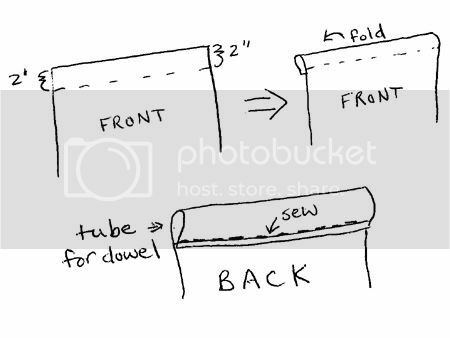 What I Did: I also sewed the shirt according to the pattern. 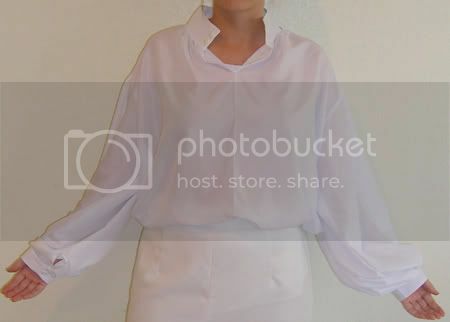 Again, I hand-sewed the buttonholes on the neck and wrist. 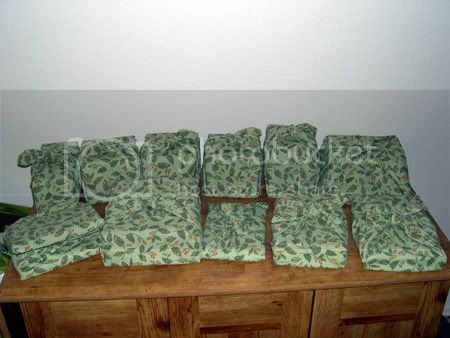 What I Liked About the Project: The fabric is light and comfortable. What I Didn't Like About the Project: The shirt was the last thing I sewed and I did not have time to figure out how to add ruffles to the neck (as Jack's shirt has). 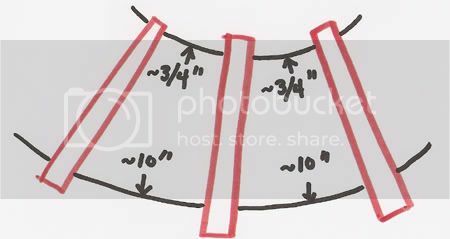 Also, the shirt tail needs to be made shorter because there is too much to tuck in. * Update 8/22/08: I just found out that McCall has discontinued both of the patterns I used in my costume (4626 and 4864). They're still available in the "Out of Print" area of their website but I'm sure they won't be around much longer. However, I recently ran across Butterick pattern B3072 which is really a better match for all the pieces in the costume than the McCall patterns. The Butterick pattern has the jacket, vest, shirt and pants all in one package. 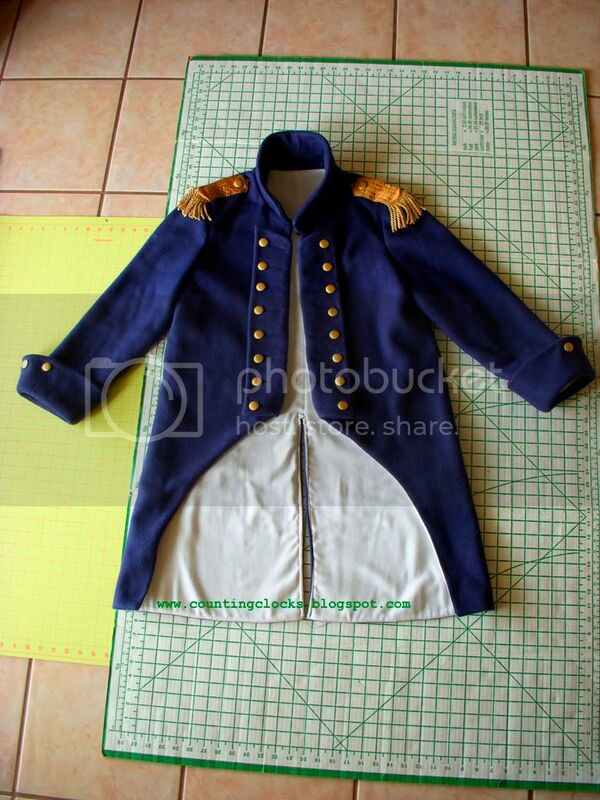 If you're looking to make your own Jack Aubrey costume I would definitely suggest starting there! Kevin and I hosted a Halloween party this year, which gave me an excuse to wear a costume! 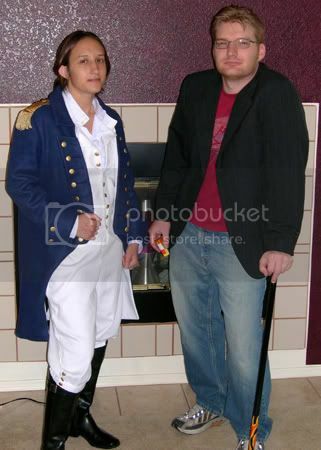 I went as Captain Jack Aubrey (Russell Crowe in the movie Master and Commander: The Far Side of the World). Kevin went as Dr. Gregory House from House MD. The Gregory House costume was pretty simple since Kevin already had the jacket, shirt, jeans, and sneakers. For House's Vicodin, I got an old pill bottle and put Tic-Tacs in it. The only part of the costume I actually made was his flame cane (see project description below). I searched all the area thrift stores trying to find a wooden cane but no luck. The drug stores had metal canes but they were expensive. 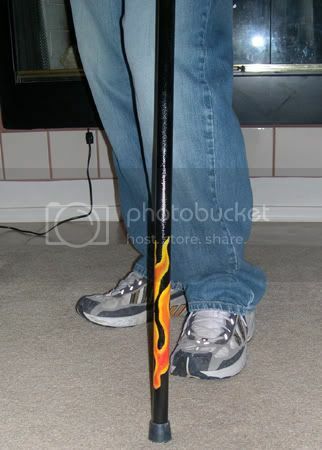 They actually sell the real flame cane online at several cane stores (only about $25) so if I had the time I guess I could've ordered one. But since Kevin was only going to use it for one evening it wasn't really worth it! What I Did: To make the knob on the top of the cane, I cut a 7/8 inch hole in the ping pong ball with the drill. 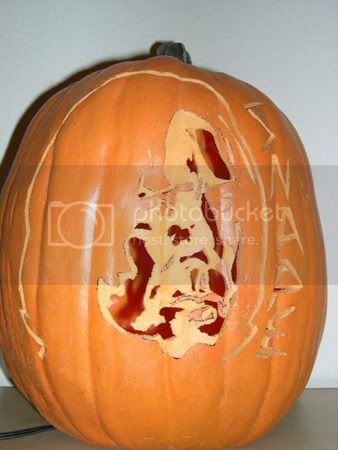 It was hard to do and the hole was a little ragged but it was adequate. I put a generous amount of white glue on one end of the dowel and stuck the ping pong ball over that end. I then spray painted the whole thing black. 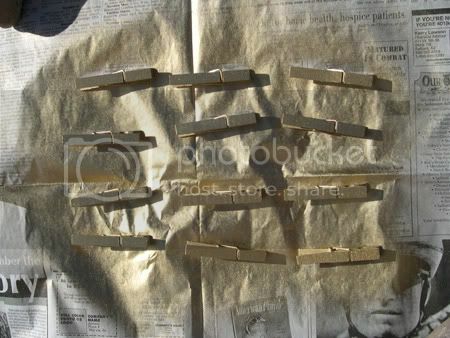 Once the spray paint dried, I used chalk to draw the flame decal on the lower end of the dowel. I then painted in the chalk outline with gesso (basically a white primer). 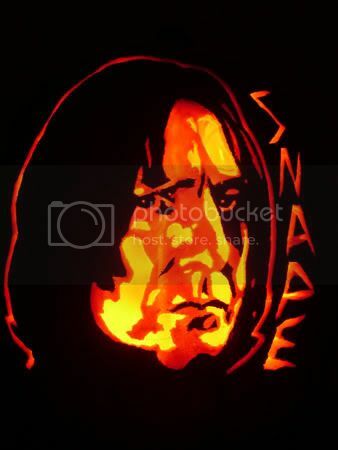 Without the gesso, the black would've shown through the yellow on the flames. Then I painted the flames over the gesso. I let that dry and then gently wiped it down with a wet paper towel to remove the chalk and other debris. Next I spray painted the whole thing again with several coats of the clear gloss. I let it dry overnight, then added the rubber chair foot. What I Liked About the Project: I think the flames turned out alright, considering I painted them at about 11 p.m.
What I Didn't Like About the Project: I really would've preferred a "crook" cane (hooked top like a candy cane) for accuracy, but they were too hard to come by and, with my experience, would've been impossible to make! 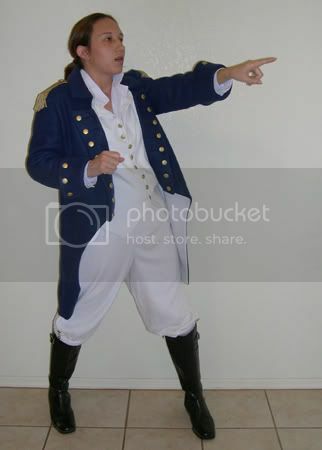 Since the Jack Aubrey costume was so complicated, I think I'll give it it's own post. P.S. - If anyone noticed our blooper, Kevin has the cane in his left hand but House actually holds his cane on his right. But since I have never seen Kevin wear so much as a funny hat, his wearing a full costume was a unusual event and I wasn't going to push it by telling him to switch hands!